Figure 1. Desch, S., Smith, N., Groppi, C., Vargas, P., Jackson, R., Kalyaan, A., Nguyen, P., Probst, L., Rubin, M., Singleton, H., Spacek, A., Truitt, A., Zaw, P. and Hartnett, H. (2017). The thinning of the Arctic ice cap. 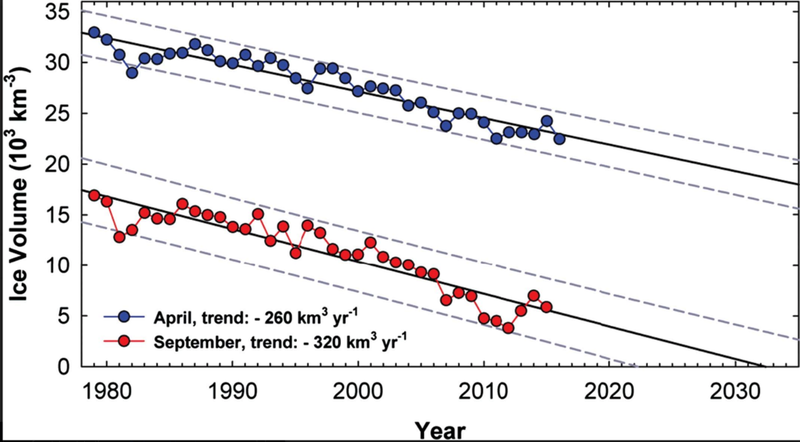 "Linear fits suggest sea‐ice volume at the end of Arctic summer is decreasing by 320 cubic kilometers per year and will vanish by the early 2030s or sooner." - Desch, S. J., et al. Article IV: Explain why geoengineering could be considered a potential solution. It has been established that Arctic permafrost is thawing as a result of global warming due to the Earth's poles warming faster than the rest of the planet. The long-term solution to this melting is halting the current rate of global warming. Many potential solutions exist, but most of these would require a lot of time to have a noticeable effect on the environment, and that is time we – or our planet – might not have to spare. These potential solutions include rapidly decreasing the rate of fossil fuel burning and consumption, reducing global methane (CH4) emissions by decreasing cattle production, and replanting large areas of removed forestation. If these were put into effect, it would slow down global warming. Unfortunately, the Arctic permafrost is thawing too rapidly for these solutions to be successful. A more rapid solution is needed to stop the Arctic's sea ice from disappearing and preventing the permafrost form thawing completely. Some solutions are more extreme than others, and I read a paper published about a potential Geoengineering solution. This might not be the most feasible of projects, but I am using it to showcase how geoengineering solutions – however crazy – could offer a more rapid solution to an extremely urgent global problem. A team of scientists have proposed a geoengineering solution involving Arctic ice management (Desch, S. J., et al.). Arctic ice management refers to the effective refreezing of the Arctic polar ice cap. Increased loss of Arctic sea ice in summer is an anthropogenic problem that is only likely to keep accelerating. At first glance, this solution appears much too extreme for the world to ever undertake but when taking a closer look, it might be a solution worth considering if extensive testing can establish its feasibility. The sea-ice volume is decreasing at a faster rate than sea-ice extent which creates a feedback that furthers warms the Arctic and thaws more and more permafrost – this means that the ice is effectively thinning (Desch, S. J., et al.). The sea ice extent decrease is more easily visible in satellite imaging but the rapid volume decrease of the sea-ice is just as alarming if not worse. This anthropogenic problem might just need an anthropogenic solution involving geoengineering. Losing Arctic sea ice decreases Earth’s total reflectivity and exposes the dark ocean to absorb more incoming radiation from the Sun. The increased heat absorption would act to accelerate Earth's temperature increase (Desch, S. J., et al.). If left unresolved, the billions of metric tons of carbon stored in the Arctic permafrost is at risk of being released even more rapidly. Imagine the extreme weather events that would be in store if all this carbon was to be released as greenhouse gases. Geoengineering the Arctic to increase the summer sea-ice retention could be done in two main ways according to this study. One way would be to reduce the amount of incoming sunlight via the use of sulphate aerosols. This would effectively block sunlight, but releasing sulphate aerosols into the atmosphere would have many negative side effects. The other method would involve creating more ice during the Arctic winter. We would need to devise mechanical method to pump or spray massive amounts of seawater on top of the pre-existing ice (Desch, S. J., et al.). In order to devise a proposal for this method, we must first understand how seawater freezes. In the Arctic, seawater typically starts to freeze in September when the surface temperature stays below -1.8°C because this is the freezing point of water with a salinity level that is near 35 parts per thousand (ppt). In the winter, average surface temperatures in the Arctic drop to -40°C. The only problem is that in the Arctic, sea ice freezes from the bottom. The very cold ice comes into contact with seawater and causes it to freeze, but this only occurs if the latent heat of fusion can be carried away from the bottom of the ice sheet to the surface. Now, what is this latent heat of fusion? In the same way that it takes energy – or heat – to melt ice, freezing of water actually emits energy. Sea ice forms from the bottom, so the released energy must first travel up through the ice before being able to be radiated away from the surface. A more effective method according to this study would be to freeze the ice sheet from the surface. The latent heat of fusion can then escape directly from the surface of the ice (Desch, S. J., et al.). In other words, water pumped directly onto the surface can freeze more rapidly than it would naturally. The proposed idea is to erect millions of wind-powered pumps around the Arctic, these would then distribute seawater onto the ice for it to freeze as an extra layer and gradually make the ice cap thicker again. The research team estimated that by pumping 1.3 meters of water onto the surface every year, this would result in the ice being thicker by 1 meter. They have calculated that adding 1 meter of ice thickness would be equivalent pushing time back by 17 years of ice melting (Desch, S. J., et al.). The Arctic Ocean is about 10 million square km and if pumps were to be distributed so that 10% of the area can be covered with water, about 10 million pumps would be needed. If 100% of the Arctic were to be covered, about 100 million pumps would be needed (Desch, S. J., et al.). The team has predicted that approximately 10,000 kg of steel would be required to build each pump. For comparison, the US currently produces about 80 million tons of steel annually, and global production is about 1,600 million tons of steel per year (Desch, S. J., et al.). Ten million wind-powered pumps would therefore require about 100 million metric tons of steel, which represents about 6.25% of the global annual production. The proposed wind pump would be installed on a large buoy to capture the wind energy that would allow it to pump seawater onto the surface of the ice. It would have to be built to withstand wind speeds outside the operating range of the turbine that may occur, it would have to be built so that water inside the device would be prevented from freezing, and it would have to withstand ice riming which is a common problem in the Arctic when it comes to wind turbines. The design of the pump must also not be susceptible to tipping due the high wind speeds that occur in the Arctic (Desch, S. J., et al.). The team has estimated a cost of about $500 billion per year to cover the entire Arctic, or $50 billion per year to cover 10% of the Arctic. They believe that covering 10% of the Arctic with wind pumps would be enough to reverse the current trend of annual sea ice loss (Desch, S. J., et al.). For comparison, $50 billion per year represents less than 0.1% of yearly world gross domestic product. There are some environmental costs associated with this method. Every ton of steel produced would emit 1.8 tons of CO2, so the production of 100 million pumps would generate about 18 million tons of CO2 annually (Desch, S. J., et al.). Compared to the worldwide annual production of about 36 billion tons CO2, this would be an increase of 0.5% in emissions (Desch, S. J., et al.). The production of 10 million pumps would mean an increase in global emissions of 0.05%. This may sound like a lot, but this increase in CO2 emissions would not surpass the emissions that would be created if all of the Arctic permafrost were to melt, along with all the carbon stored in it. As you might recall, there is about twice as much carbon stored in the Arctic than there is currently in the atmosphere. Therefore, in my opinion, the environmental costs associated with this method might outweigh the benefits. This proposal is to be taken lightly, it is not an absolute solution and it would bring with it its own problems. My hope is just that is has gotten you thinking about alternative solutions that at first glance may seem crazy. I do not fully believe yet in our capacity to change our global consumption patterns rapidly enough to stop this Arctic demise, so we might want to consider geoengineering solutions as we are rapidly running out of other options. Desch, S., Smith, N., Groppi, C., Vargas, P., Jackson, R., Kalyaan, A., Nguyen, P., Probst, L., Rubin, M., Singleton, H., Spacek, A., Truitt, A., Zaw, P. and Hartnett, H. (2017). Arctic ice management. Earth's Future, 5(1), pp.107-127.